I’m not the most patient of people and I’m also competitive – I’ve mastered being able to ‘win’ at anything, especially when I’m the only person involved. So when it comes to dating despite knowing something will happen unexpectedly and when the time is right I’m easily frustrated. So whilst hungover over the bank holiday weekend I decided to download Tinder. Having been in a relationship until last August I’m late to the party with this one so I doubt much of what I have to say will surprise many singletons but it’s given me a giggle for seven days. I should have known what I was putting myself through when my first match wasn’t some outdoorsy active hunk, DILF or intellectual geek with come to bed eyes. His name was Sudan and he’s a northern white rhino, to be fair in his early forties he’s within my desired age range. Plus I did swipe right because I’d read the article about him a few days before. Unlike most of the other matches this week Sudan also took time out to message me, which can’t be easy with feet that big. I guess he used an iPad. The next couple of days played out pretty much as I anticipated. I’ve chatted to a few guys and exchanged numbers with a couple. Pretty much the same experience I’ve had with POF since joining in March. Midweek I’ve had a busy time in the office so it wasn’t until I was bored Thursday evening that I started to swipe through a few guys up in Manchester again. And that’s when it happened – my first #tinderfail. I’m not sure why I was so shocked too see yet another gay man I know using the app but I got distracted when the guy who cuts my hair popped up. We had an unusual mix of connections via Facebook and somehow whilst trying to take a look at them again I managed to ‘super like’ him. Mortified but deciding to soldier on I’ve carried on swiping over the weekend. 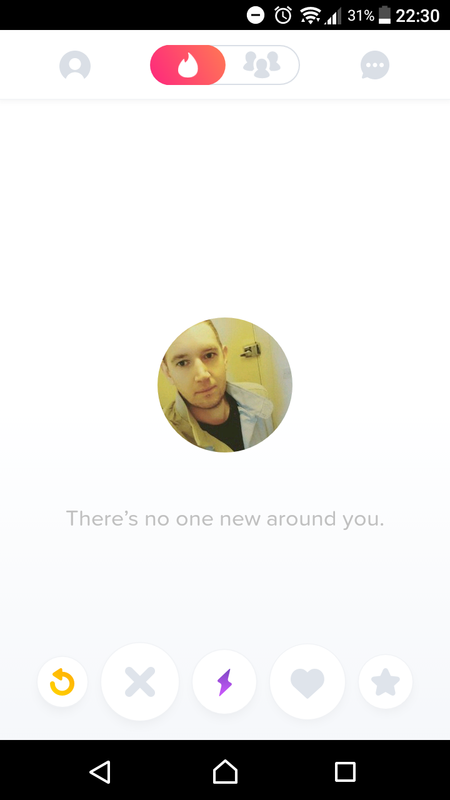 And I’d be swiping right now but apparently there’s no one left to look at. Am I that fussy or deluded or is this a marketing tool to make me fork out for add-ons? Probably a bit of both. I’m not sure Tinder is for me but if I get nothing else out of it, at least it’s been a source of entertainment for a week.